This entry was posted in History and tagged Blondin, Niagara Falls. Bookmark the permalink. This story reminds me: John Roebling (of Brooklyn Bridge fame) built the first bridge across Niagara Falls. Before any construction could begin on that bridge he first had to get a cable from one side across to the other. Any guess as to how he did it? First of all, welcome, Lee! And you’re right — Roebling’s bridge over the Niagara River was the first railway suspension bridge in the world. He had a little help in getting there, though; a guy named Charles Ellet, Jr. had constructed a foot bridge across the Niagara in 1848. Here’s how he did it: first they flew a kite across the river. (Seriously!) The kite string was attached to a point on the other side of the river; a rope was attached to the kite string and fed across. Successively heavier cords were sent along that same path by a system of pulleys. Eventually a wire cable was pulled over, and not long after, the bridge went into service for pedestrians. Before long, Ellet got into an argument over money with the authorities and was replaced by Roebling, who used the footbridge as scaffolding to begin construction of the railway bridge. Heavier elements were brought into place by flat boats; sturdy pylons were being constructed as well. 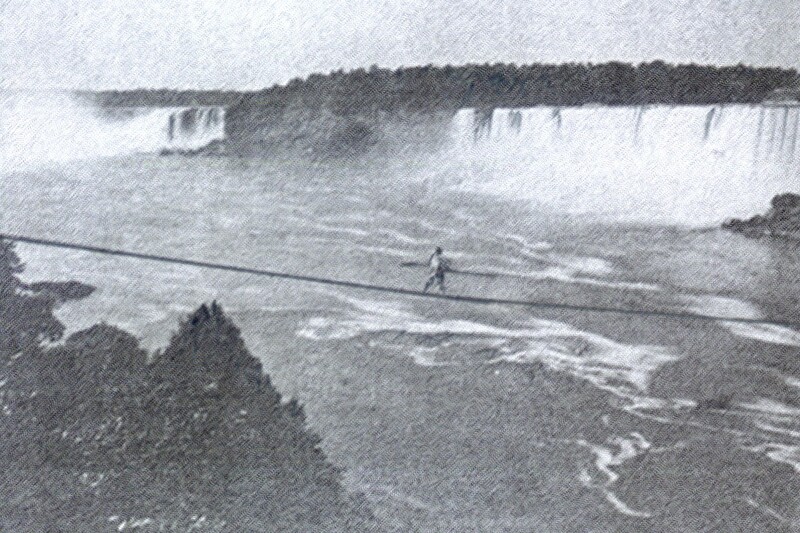 The first train crossed the Niagara River on March 8, 1855 — four years before Blondin’s initial high-wire stunt. Your picture is reversed left-to-right and probably does not show Blondin, who so far as I know did not cross the Niagara Gorge so close to the falls. There are several photos of Niagara Falls in existence that I personally took, but obviously this is not one of them. This was acquired from an archive, which showed it with this orientation and identification. Of course, they may very well have it wrong. You’re a much more authoritative source on this subject than I am, Dr. Hughes — if the daredevil depicted here isn’t Blondin, do you have an idea who it might be?